As soon as you have started seriously thinking about getting pregnant, be sure you ask yourself the question: "What if something goes wrong and interrupt my pregnancy, and I lose my baby? Is my body prepared to bear and give birth to a healthy child?" Just read on-line forums and you will see how many women suffer from the loss of desired pregnancies. Loss of pregnancy is the harsh reality that many couples face. According to statistics, 40% of all pregnancies are lost, of which 15-20% are confirmed pregnancies. Only the woman who has lost her own child really knows how painful and anguished pregnancy loss is. Having lost one's pregnancy, a woman is stressed, sometimes in a state of shock, asking herself: "Why me? After all, my health is all right!" She feels guilty and blames herself for doing something wrong, something that caused the loss. As time passes by, she will reconcile herself to her pregnancy loss, but, unfortunately, she will never ever forget the child she has lost. The later the termination of pregnancy happens, the more emotionally stressful it is for a woman. However well you may think of your health condition, pregnancy loss is always caused by existing abnormalities in your body. And the problem lies in the fact that pregnancy loss can be recurrent. The fear of losing another pregnancy will stay with you until your doctor announces the birth of a healthy child. Yes, a healthy one. Because some children are born prematurely, impaired, having organs dysfunctions, congenital diseases and malformations. And then the birth of a hoped-for child will change your life instantly, turning it into hell. And till your dying day you will blame and reproach yourself for not being able to provide your child with good health condition, and thus doomed the one to a lifelong torment and suffering. Just because you did not plan your pregnancy properly and did not ascertained if your body was ready for pregnancy. Sure, you can see your gynaecologist and undergo routine examination. However, having just routine examination results, the very best gynaecologists cannot guarantee that your future pregnancy is not at risk. Here innovative technologies are providing considerable assistance. Nowadays, complete examination by means of the “ELI-P-Complex” test can guarantee the normal course of pregnancy and the birth of a healthy child. Every woman needs to have the “ELI-P-Complex” test done while prepare herself for pregnancy or, at worst, during the first trimester. 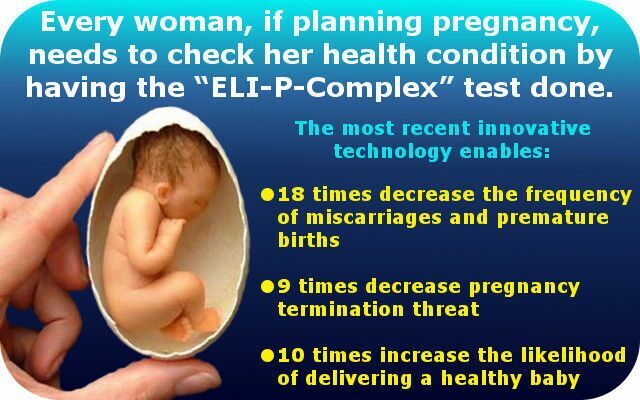 Recent clinical studies show that the “ELI-P-Complex” test application several times decreases the frequency of miscarriages, premature births, pregnancy termination threat and other pregnancy complications, as well as significantly increases the likelihood of delivering a healthy baby. You will find more details about the new diagnostic methods in section “Our test systems”, subsection “ELI-P-Complex Test”.